Summer is in full swing, and I don’t know about where you are, but it’s been a hot summer so far up here! This has me longing for things like cool bodies of water to dip my toes (or entire self) in, shady trees to read under, and icy cool treats. And while there is something to be said for making a trip to your local ice cream shop, it’s easy, fun, and economical to make your own treats at home. One of the easiest summer treats you can make is the good ol’ popsicle. Making popsicles really brings me back to my childhood (how old did that just make me sound?!) We had this white and red Tupperware popsicle mould, and I remember mixing up whatever variety of Kool-Aid we had in the house, filling up each little cup with the brightly coloured sugar water, and waiting for it to become that tasty frozen treat on a stick. Sadly that mould has long since disappeared, as had my popsicle making days. Until this summer, when I decided it was time to make popsicles again. My tastes have morphed a bit since I was a kid. No longer did I want to fill my newly acquired popsicle mould with sugar water that rivalled its lime green colour. I wanted something more natural, without added sugars or colours. Something that just contained sweet summery fruits. And what’s more summery than juicy pink watermelon? 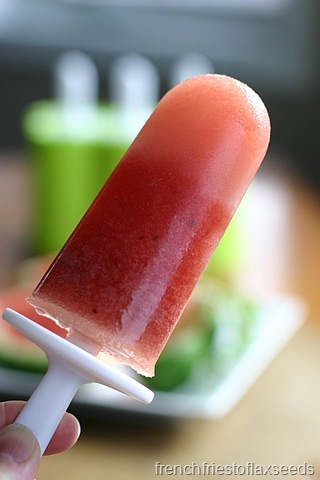 Honestly, watermelon was an excellent choice for my first foray into homemade all fruit popsicles. It has a high water content, meaning I didn’t need to add any extra liquid to get something that would make the perfect icy treat. And it’s naturally sweet enough, without being too sweet. Plus it just makes for a pretty popsicle! I added a bit of lime juice for a little extra zing, and threw in a sprig of mint because it seemed like fun. I liked the hint of mint, but you could definitely leave it out. 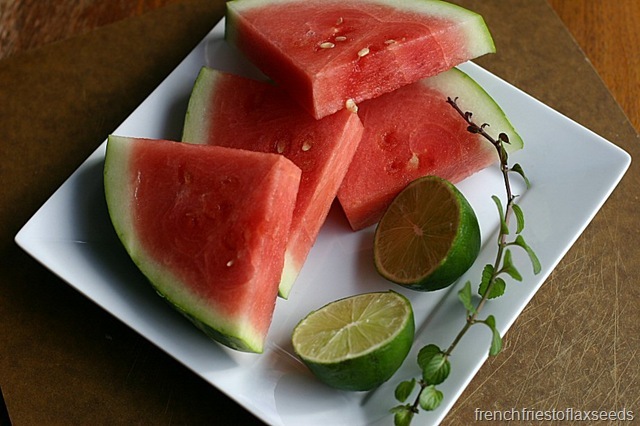 Even leave the lime out if you just want pure watermelon flavour. 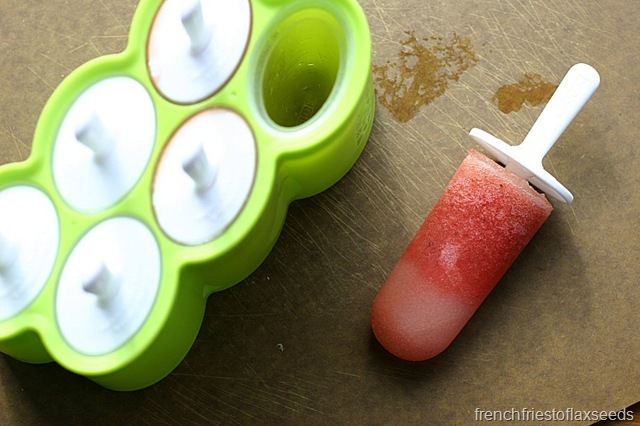 Now get out your blenders, and make your own fruit popsicles! I already have a million other flavour combinations I need to try before all the summer fruits are gone! Summertime heat means it’s time for icy treats! 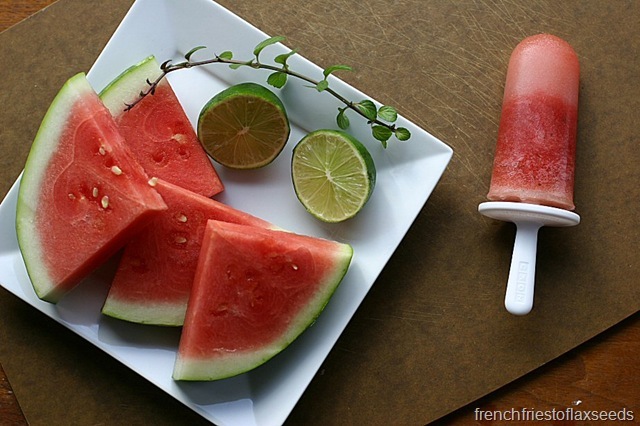 These all fruit popsicles combine the refreshing tastes of watermelon and lime to make a pretty pink icy treat that’s easy to make with the kids. The hardest part is waiting for them to freeze so you can enjoy them! 1. Combine all ingredients in a blender, and blend until liquefied. 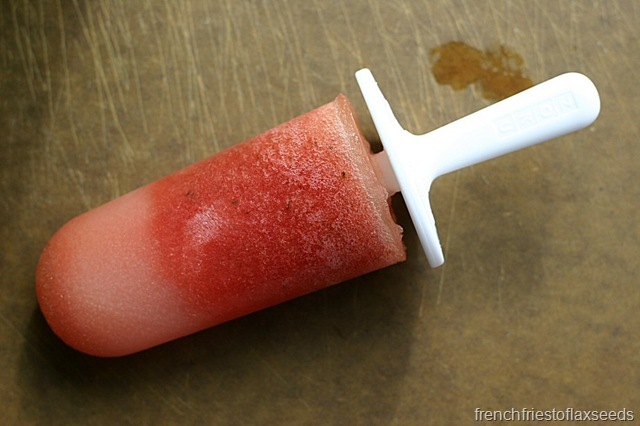 Pour into popsicle moulds, and freeze for several hours, until solid. Note: Experiment with other fruit combinations. You may need to add extra liquid if your fruits aren’t as watery as watermelon. What’s your favourite summertime frozen treat? ← How Do You Herbamare?